3 rhizomes. These are great foliage plants for full or partial shade conditions in zones 7-11; perfect for the back of a border, as they will reach 4-6 feet tall. The pinecone ginger sends up green pinecone-shaped blooms in mid to late summer (the blooms stalks are about 2 feet high) and these get small yellow flowers on them. The cones slowly turn to a deep red through the fall and make excellent cut flowers, lasting for weeks in a vase. These are great foliage plants for full or partial shade conditions (although they can grow in mostly sun, or even full sun, they tend to do better and get taller in partial shade) in zones 7-11 perfect for the back of a border, as they will reach 4'-6" tall. 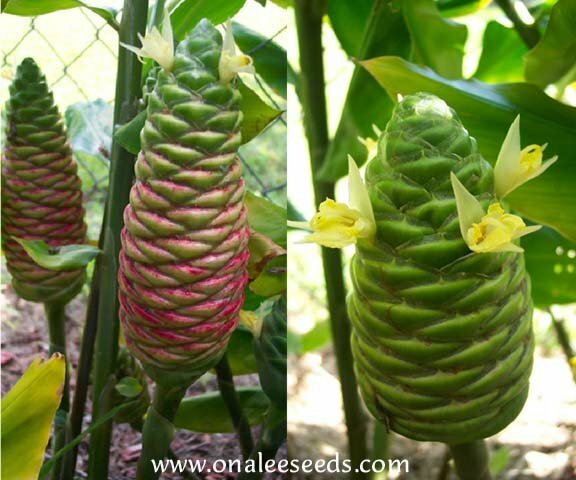 The pinecone ginger sends up green pinecone-shaped blooms in mid to late summer (the blooms stalks are about 2" high) and these get small yellow flowers on them. The cones slowly turn to a deep red through the fall and make excellent cut flowers, lasting for weeks in a vase. The foliage will die back in the winter, but will return in the spring. 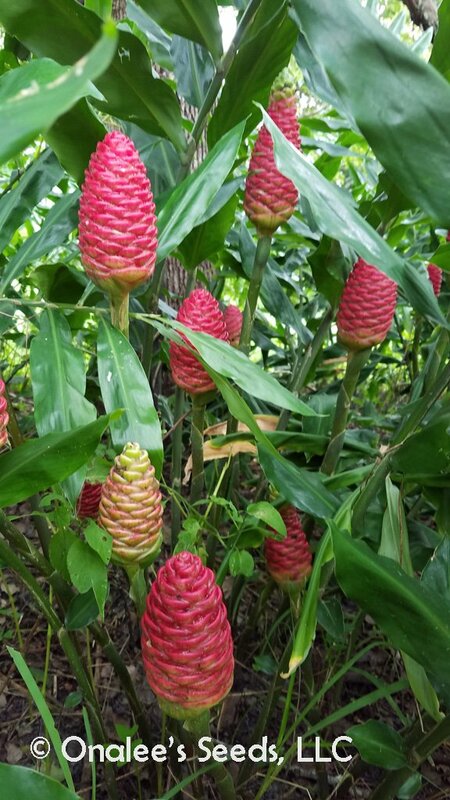 This plant is most widely known around the world as the Shampoo Ginger for the juice in the cones, and it is in fact used as a shampoo in Asia and Hawaii, and as an ingredient in several commercial shampoos. I find that using it as a final rinse on my hair leaves my hair softer and silkier than just using shampoo and conditioner alone. You can leave it in or rinse it out. A friend of mine also says it helps with her itchy skin, she rubs a little on her arms and hands and it relieves the itch caused by medications she's on. 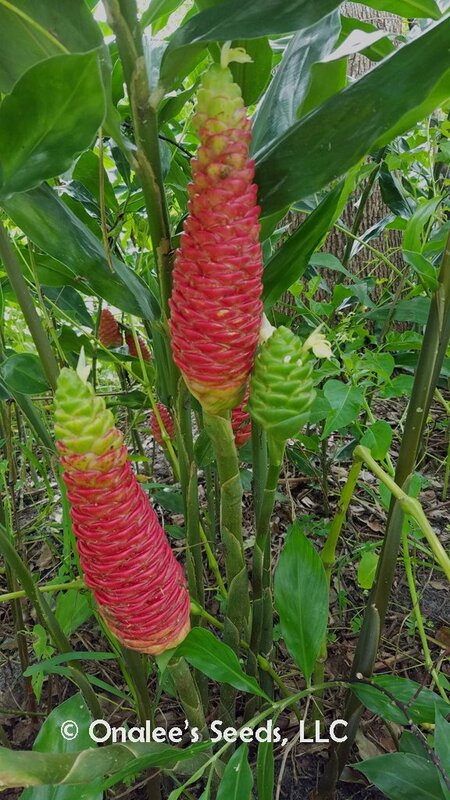 Shampoo ginger was used as medicine for sprains, indigestion and other ailments. In traditional use, the root was ground with a stone mortar and pestle, and the pulp was placed in a cloth and loosely bound around the injured area. To ease a stomach ache, the ground and strained root material was mixed with water and drunk. For a toothache or a cavity, the cooked and softened 'awapuhi root" was pressed into the hollow and left for as long as was needed. These plants are great in zones 7-11, but can be grown in containers or the rhizomes could be lifted and stored over winter like other tender bulbs in colder zones. Very tolerant of dry conditions,but can also grow in fairly moist soil grows best in well draining, sandy soil. In the last photo below are some examples of the rhizomes you will be getting (you will receive THREE rhizomes). Gingers go through normal rest or dormancy periods. During these non-growing phases they can be dug and replanted without disturbing their growing cycle. Each ADDITIONAL order of 3 rhizomes is only $12! 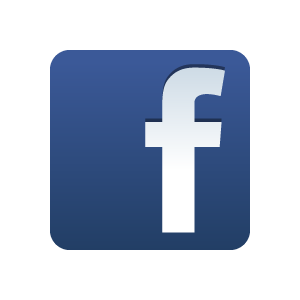 Use the drop-down box near the order button to get discount on larger orders.